Can you imagine a life without smartphone and your favorite apps ? Well, we live in a time where mobile apps have greater importance in our life than we really think. And that’s why we see “smart” gadgets/appliances around us from smart lights to smart door bells – all of which can be controlled via apps installed in your smartphone. Thermostats is one of the first gadgets that became truly “smart” when Nest released the worlds first smart thermostat in 2007. Nowadays all smart thermostats can be controlled via smartphone apps – be it an iphone or android phone. In this guide, we write about smartphone controlled thermostats – which are basically thermostat models that can be controlled via apps installed in smartphones. We can also call them internet thermostats or internet controlled thermostats – as the whole control is facilitated over internet. 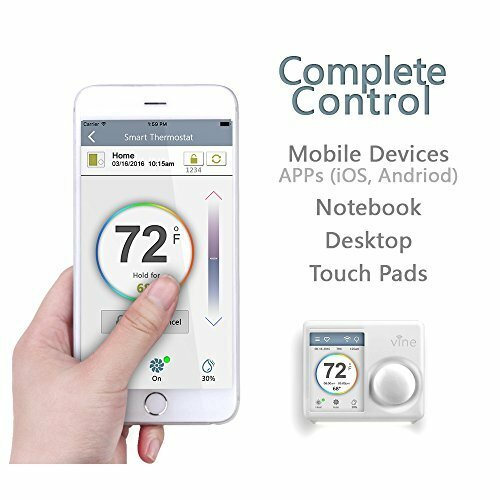 Apps are made available in Google Play Store and Apple iTunes by respective manufacturers, and users can download apps to control their smart thermostats. Smart Thermostats – Why ? As you know already, smart thermostats are something revolutionary. Imagine a system adjusting the room temperatures based on your activity or presence! Imagine the heater or air conditioner in your home working on idle when you are not home but springing back to action a few moments before you reach back home! Thanks to the smart thermostat, you will no longer have to imagine it! The technology is already here. If the smart thermostat doesn’t win you over with its smart features, the energy savings definitely will! Smart thermostats can save upto 23% of energy usage annualy compared to an ordinary thermostats. The actual savings will vary with your home conditions and based on manufacturer. So far the best case study reported 23% of annual savings. 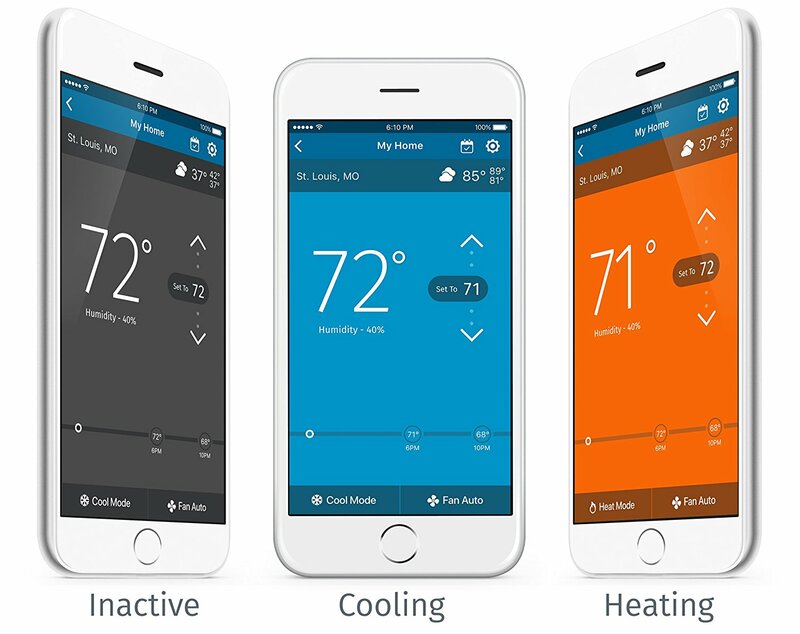 Why use a Smartphone Controlled Thermostat? The predominant reason why smart thermostats have gained so much traction can be attributed to their role in saving energy and cutting fuel costs significantly. If your home heating/cooling systems were to make changes to the temperature inside your home based on the outside climate and the level of activity, then you are looking at a system that will give you optimum performance. You can control the room temperature at your home when you are at work. You can keep the home at a stable temperature when you are away on vacation. The smartphone will alert you if there are unusual temperature changes in your home. The Geo-Fencing technology enables the thermostat to adjust the temperature as you are on your way back home. It can track you through the home to provide cooling in the room that you are currently in. You can view the energy usage reports through your smartphone. The EPA has estimated that a home enabled with smart thermostats cuts down on electricity costs by a factor of 20 to 30 percent. We’ve seen the benefits of a smart thermostat and how they save energy like none. 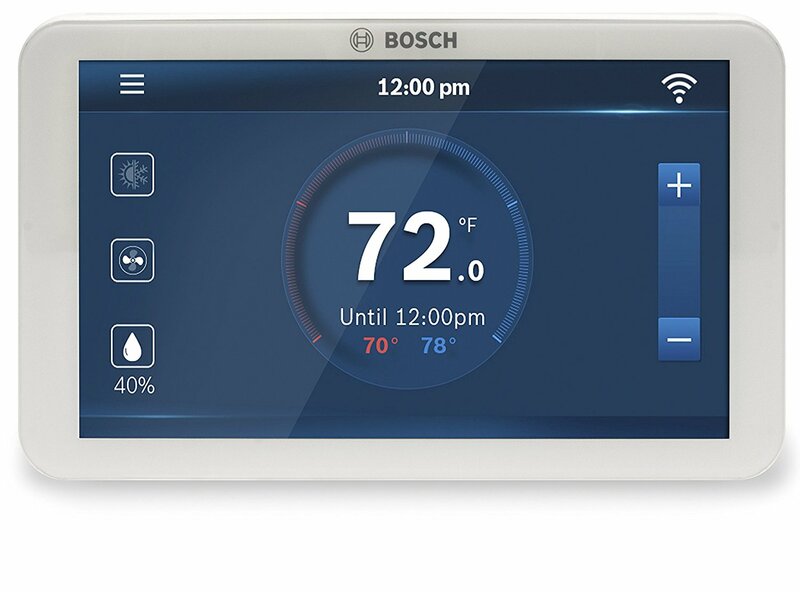 Now lets see some of the best smartphone controlled thermostat models available. To facilitate control via smartphone apps, your thermostat should be connected to internet via your home WiFi. And that’s why they are also called internet thermostat or internet controlled thermostat. 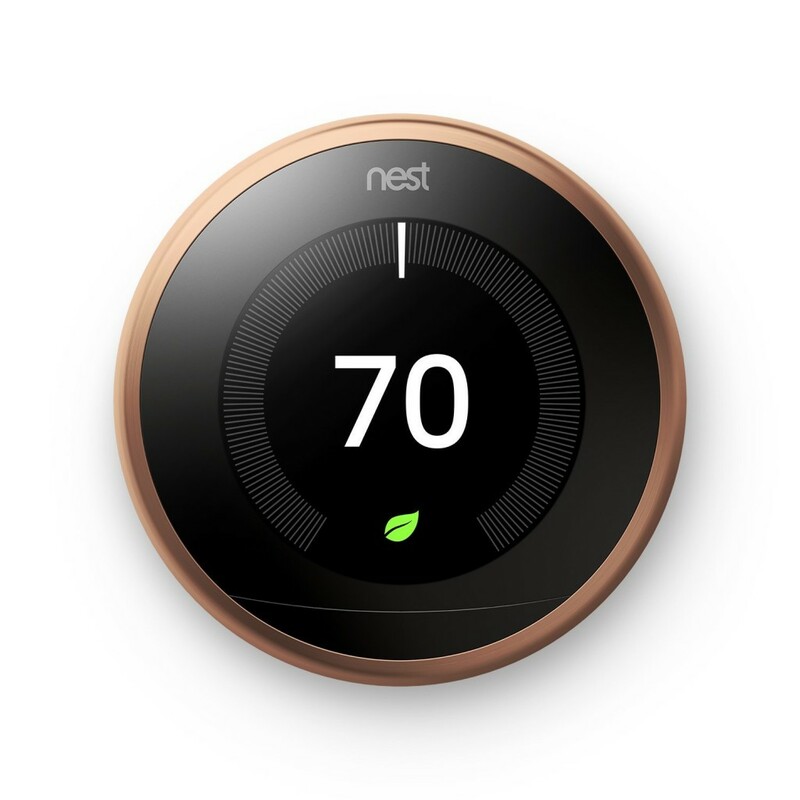 Nest has two thermostat models – Nest 3rd Gen and Nest E. Both models are smart internet controlled thermostats – which can be controlled from anywhere in the world using the iphone or android apps provided by Nest. Nest thermostats are truly smart in all sense. #self learning – they program itself automatically by studying your living habits and patterns. #save energy – they save energy significantly and Nest claims upto 12% energy savings on heating and 15% on cooling. #geo fencing – is a technology which senses when you’re nearing home from office or far away places. Nest will automatically adjust your room temperature before you arrive home. Read our full review of Nest Smart Thermostat and compare Nest 3rd Gen vs Nest E.
This article is all about smartphone app based thermostats – where you can control a thermostat using your mobile app. Let’s dig a little into the Nest App – the smartphone app to control Nest Thermostats. Nest has made its app available in almost all devices. Nest App supports a wide range of android devices as Nest is owned by Google (and android is a Google software). An equal level of support is available for iphone devices and iOS software as the majority of Americans still use Apple products. Let’s see the highlight features of Nest App. 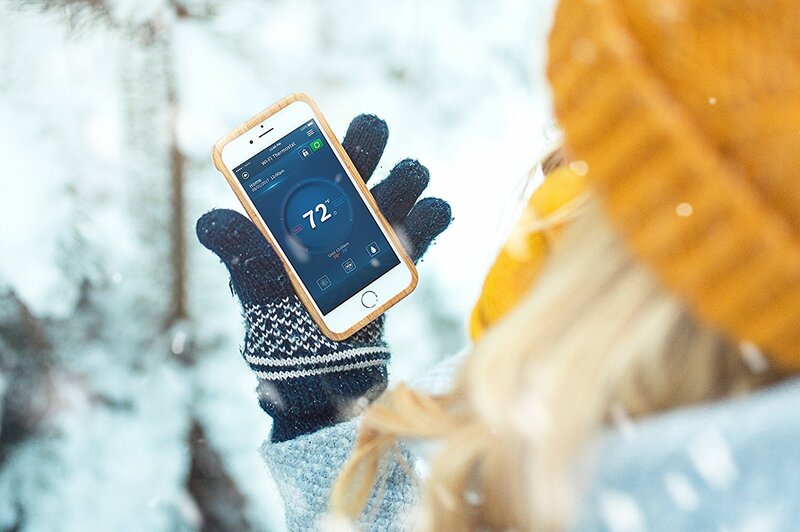 #Thermostat on your hand – You can control the device straight from your smartphone using the Nest Learning app. You can do almost all things like setting a schedule, turning ON/OFF, adjust temperature, change clock or whatever you would directly on the thermostat screen. #Android or iPhone – Nest App supports all iphone versions (iOS9 or higher) and android smartphones (android 4.1 or higher). Nest also has web based app – which is supported on Windows 7 or higher, MacOSx V10.9 or higher. In addition, Nest app also supports Android TV or Apple TV and also wearable like Apple watch and Android watch. The support for iphone or android devices is so good that you can call this an iphone thermostat or android thermostat. #Energy Reports – You can view calendar based energy reports for your home in the smart thermostat app. You can view weekly or monthly based energy reports and calculate your energy savings. #Home Away – feature helps you to manage your thermostats and control them when you’re away from home. 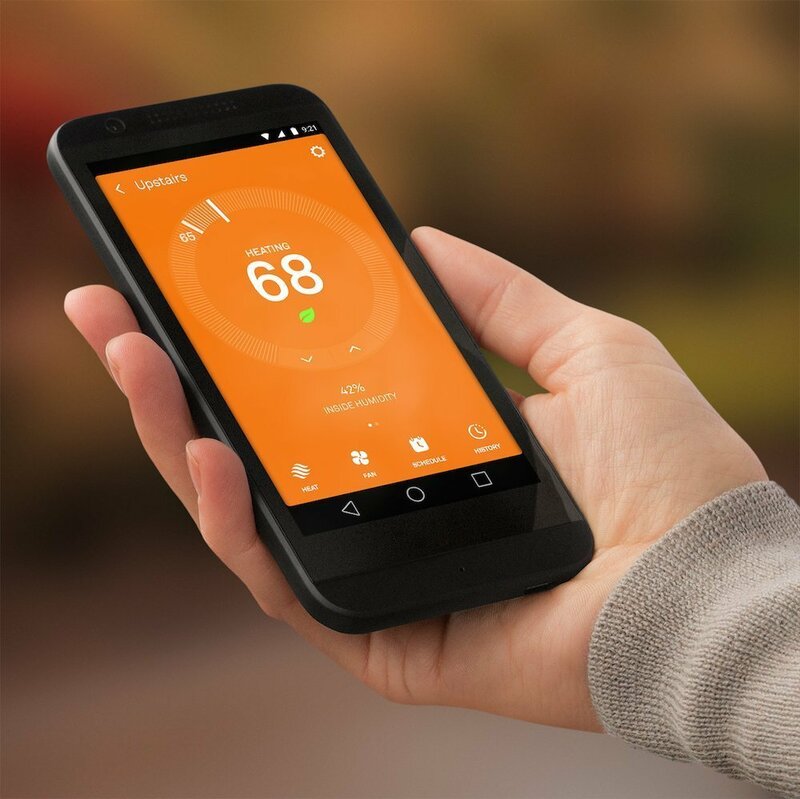 #Multiple thermostats – You can manage upto 20 thermostats in a single Nest smart thermostat app. #Family Members – Different family members can install own apps in their smartphones and pair with the same thermostat(s). 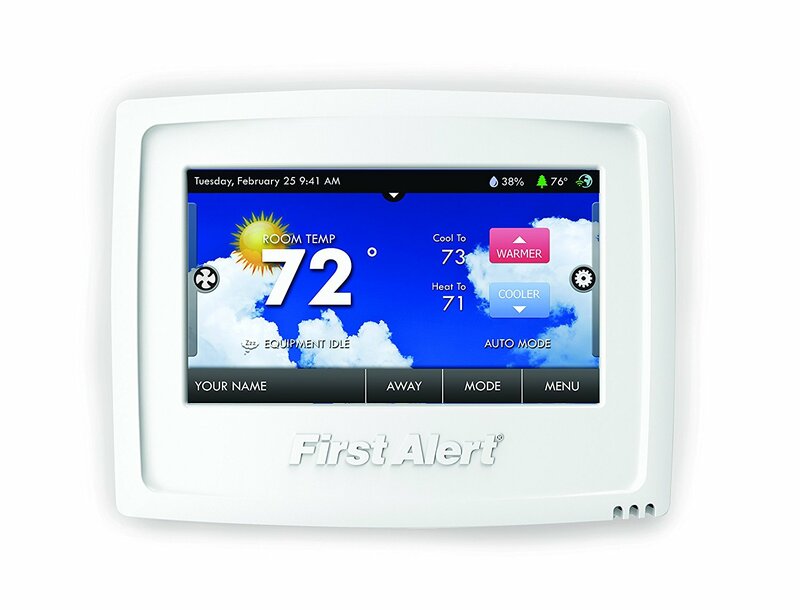 This way all family members can control the thermostat in home at their comfort. Ecobee has made a really impressive product with Ecobee4 smart thermostat. The device comes with Amazon Alexa built in! The device, hence, processes all the features that Alexa can give you. You can just speak to the device to adjust the room temperature, and this is just one of the commands that you can give. This feature is enabled using the Far-Field that Ecobee uses to recognize voice even from a considerable amount of distance. Also, the device can spot areas where there is an unusual amount of heat and can provide direct cooling to that area. The smart capabilities of Ecobee4 are fully recognized only when you know that it can be connected with various smart voice assistants like Siri, Google now, etc. The learning capabilities of the Ecobee4 are also commendable as the device can sense if you are home or not. Also, the device can track whether or not you are sleeping to set the temperature more comfortably. 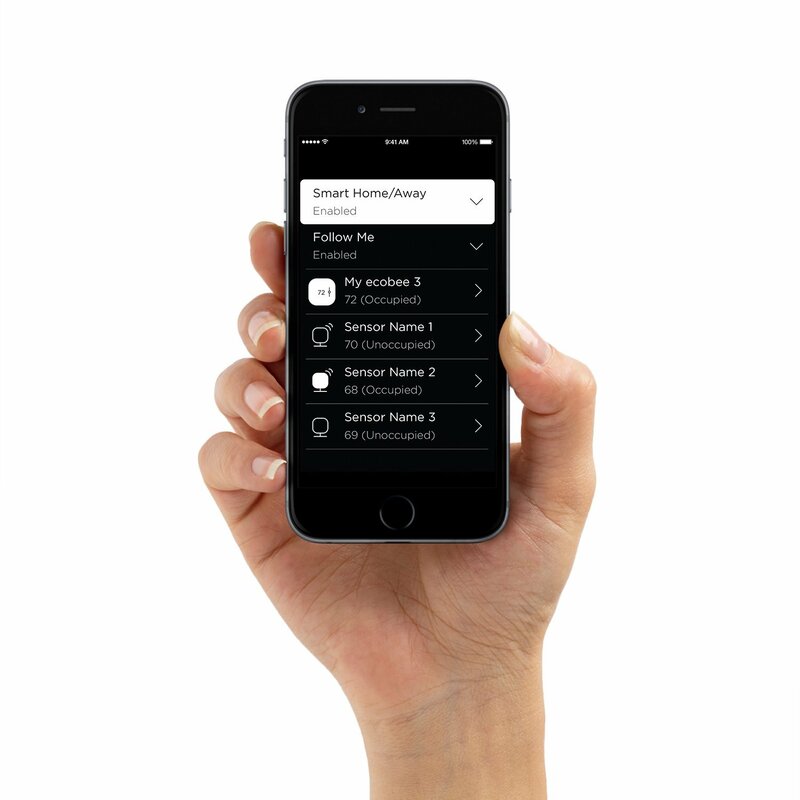 Ecobee4 uses remote sensors called Room Sensors to track whether you are home or not. This also means that the device does not have to be centrally mounted to have a grasp of the room temperatures. Also, you can add as many as Room Sensors as you want to increase the accuracy of the device to detect temperatures. If you want almost all the functions of Ecobee4 without the hefty price tag, then Ecobee3 Lite is the best option for you. When you go for Ecobee3, you will be missing out on some features like the Alexa integration. So, it won’t respond to your voice anymore, but then again, you can control the device by using your phone’s digital assistant. You will also be missing out on the Room Sensors that come with the product. Although it does support room sensors, you will have to buy them separately. Ecobee3 Lite uses Geo-fencing to make up for the lack of Motion sensors. Our top 2 picks (Nest Learning and Ecobee4) come with motions sensors. Geo-fencing uses the location of your smartphone to enable smart cooling. 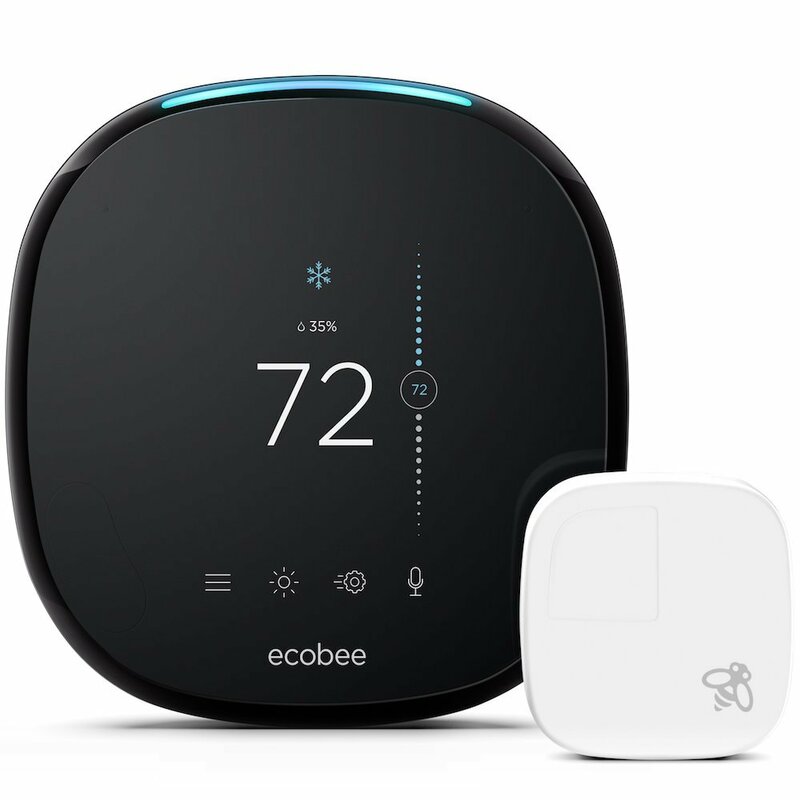 If you consider the missing features when compared to Ecobee4, Ecobee3 Lite lacks the accessory control, Humidifier, Dehumidifier and ventilator options on the device. But if all these things are omissions that you can live without, then Ecobee3 is the best option amongst the two. 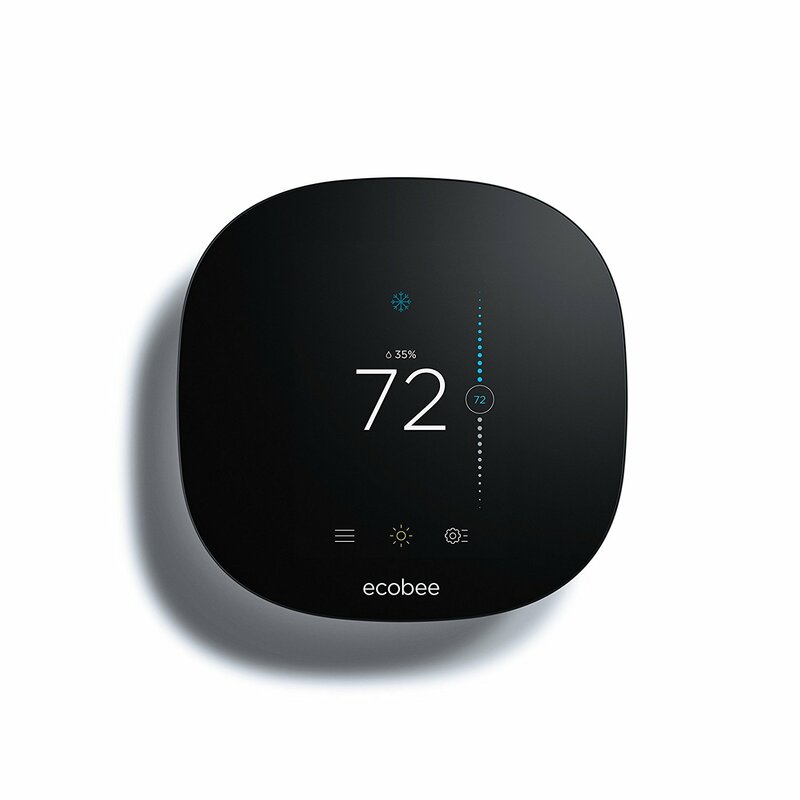 Ecobee3 looks as sleek and stylish as its costly upgrade and can do many of the functions of Ecobee4 without a hiccup. 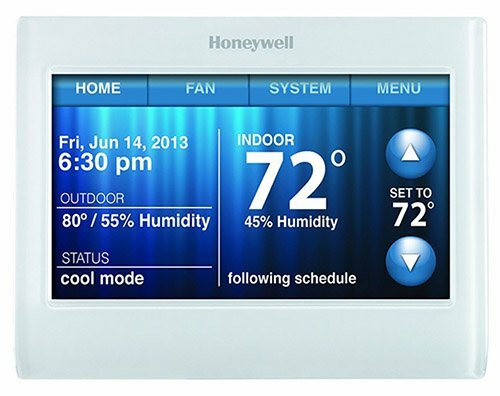 One of the best features of Honeywell smart thermostat is that it has a bright and user-oriented LCD touchscreen. 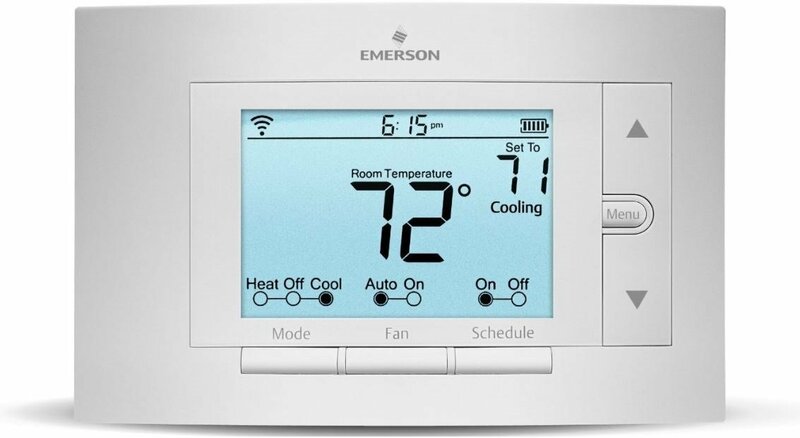 The programmable thermostat is Wi-Fi enabled so that it stays connected all the time. 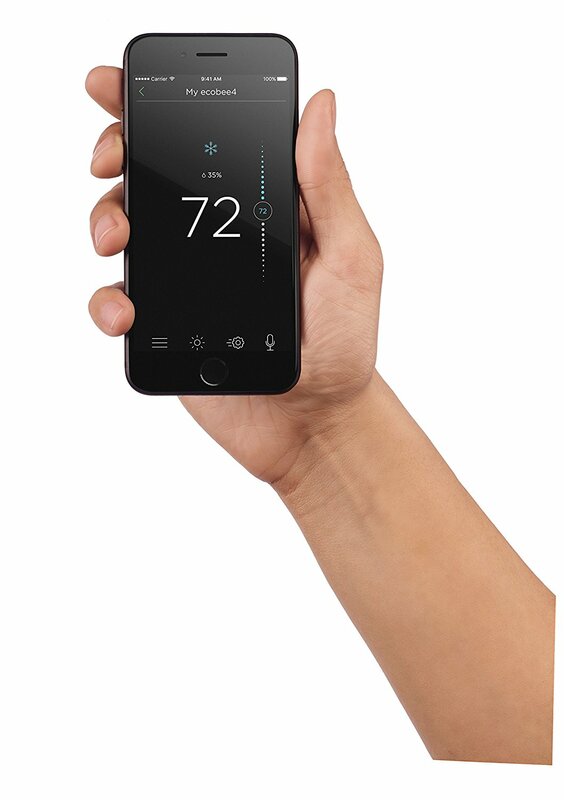 With the smart remote control system, you can control the thermostat from anywhere using your smartphone. The display shows every important information upfront so that you won’t have to interact with the device to know them. Also, Honeywell has a web app that you can use to configure your system if you can’t use the smartphone app. The seven-day schedule is a major advantage of the system. Also, it has Amazon Alexa integration to control the thermostat. 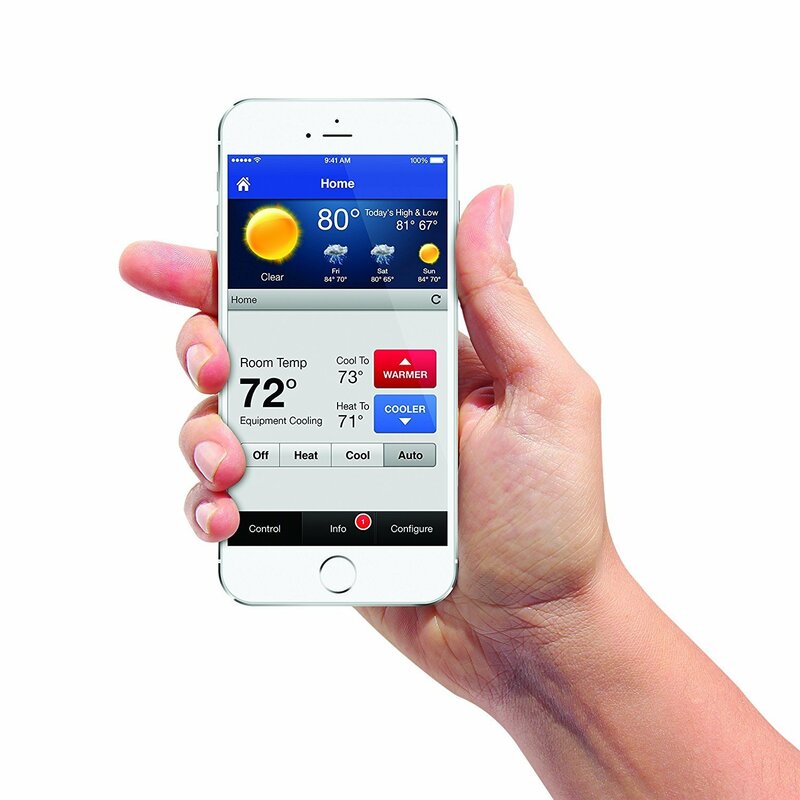 The five-year warranty makes Honeywell Smart thermostat a bargain! If these features don’t sway your decision in favor of the Honeywell Smart thermostat, then the price definitely will. It packs a great value as the price of this product is about 30% less than the top two picks on this list. So if you are after the bang per buck factor, this product might be it! Emerson Sensi smart thermostat is the best option if your home isn’t built to the modern norm of smart homes. The reason why we pitch this product is that it can be mounted in your home without any significant rewiring hassles. Many of the old homes are hesitant to bring smart capabilities because of this very reason. In most cases, The Emerson Sensi smart thermostat doesn’t need a C-wire to work. This is a huge advantage when you are planning on buying a smart thermostat for your home that doesn’t have ultra-modern air conditioning equipment. The Emerson Sensi has a very bright display and can work on a pair of AA batteries. The thermostat can be controlled via the smartphone app, and it gets all the updates through its Wi-Fi connectivity. It also plays well with mainstream AI assistants like Alexa, Google home, and Google assistant. The Geo-fencing technology is a great feature to let your air conditioning know if you are coming home early. It is a well-designed product indeed! Vine is a relatively new player in the game when it comes to smart thermostats. But that doesn’t mean it lacks the technological innovations that our top 5 picks had. The touchscreen is designed and programmed in such a way that It has a modern feel to it. Amazon Alexa integration is also a really appreciated feature. The thermostat can be controlled from your smartphone as it provides app support for both Android and iOS. The seven-day schedule is a much-appreciated option. This product also gives you the complete freedom of controlling the air conditioners in your home through your mobile. You can also use Alexa through your smartphone to control the thermostat any time you want. The full touch color display is pure joy to use. The wallpaper ability is a nice touch to personalize the device to your taste. The scheduling feature of the device helps you create custom cooling every single day. You can send texts to the thermostat, and it will be shown on the home screen. Keep a record of the energy consumption with 7-day Energy usage charts. The smart assistant helps you configure the device in minutes. Bosch is a company that has created a reputation for itself by creating top-notch products. The same trend can be seen with their smart thermostat as well. It has got smart features like Alexa compatibility so that you can control the device through your smartphone itself. Another attractive feature is its 5-inch display that shows you everything relevant at a glance. The smartphone app gives you complete control of the device. It can work just as well without the Wi-Fi connectivity (though it will affect the smartphone link). Schedulers help you pre program the device when you are away or at work. Smart homes are the future of living. They are a completely automated setup that changes the environment based on your schedules and likes. Smart thermostats don’t just cater to your comfort; they also save you time and money while doing it. With the onset of smart assistants and AI, there hasn’t been a better time than now to revolutionize how you live!